Corazon C. Aquino and Benigno S. Aquino, Jr.. Denomination 500. On banknote are María Corazón Cojuangco-Aquino and Benigno S. Aquino, Jr.
Maria Corazon "Cory" Cojuangco Aquino (January 25, 1933 – August 1, 2009) was a Chinese Filipino politician who served as the 11th President of the Philippines, becoming the first woman to hold that office. 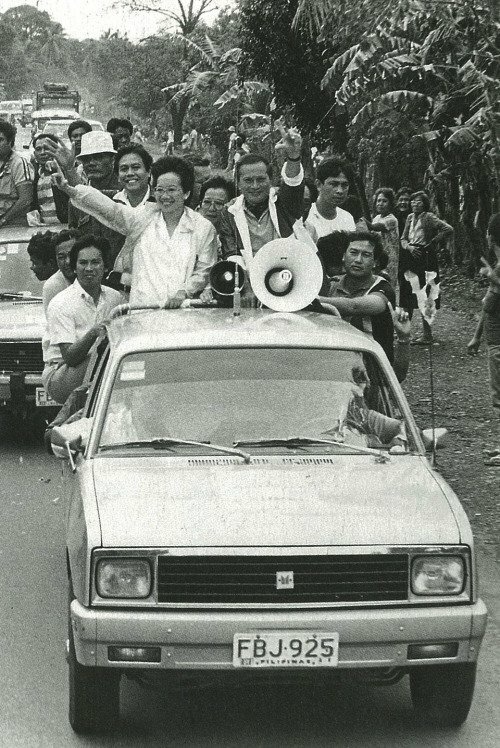 The first female president in the Philippines, Aquino was the most prominent figure of the 1986 People Power Revolution, which toppled the 21-year rule of President Ferdinand Marcos. She was named Time magazine's Woman of the Year in 1986. Prior to this, she had not held any other elective office. A self-proclaimed "plain housewife", she was married to Senator Benigno Aquino Jr., the staunchest critic of President Marcos. 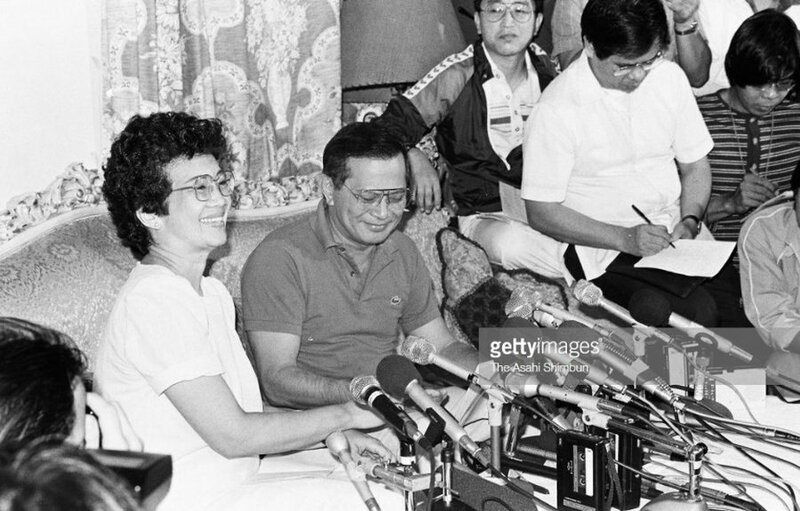 She emerged as leader of the opposition after her husband was assassinated on August 21, 1983 upon returning to the Philippines from exile in the United States. In late 1985, Marcos called for snap elections, and Aquino ran for president with former senator Salvador Laurel as her Vice President. After the elections were held on February 7, 1986, the Batasang Pambansa proclaimed Marcos and his running mate, Arturo Tolentino, as the winners amid allegations of electoral fraud, with Aquino calling for massive civil disobedience actions. Defections from the Armed Forces of the Philippines and the support of the local Catholic hierarchy led to the People Power Revolution that ousted Marcos and secured Aquino's accession on February 25, 1986. 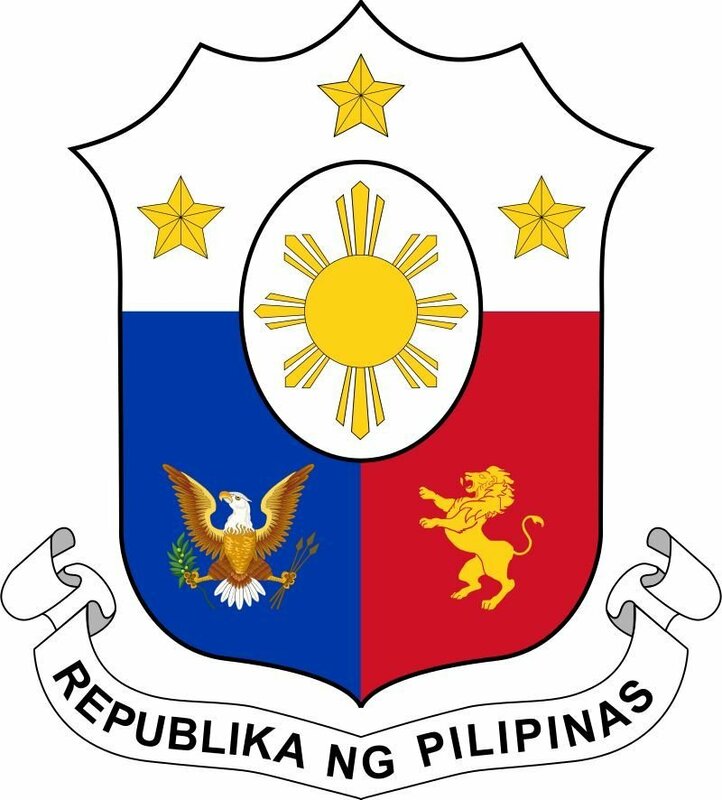 As President, Aquino oversaw the promulgation of the 1987 Constitution, which limited the powers of the Presidency and re-established the bicameral Congress. Her administration gave strong emphasis and concern for civil liberties and human rights, and on peace talks to resolve the ongoing Communist insurgency and Islamist secession movements. Her economic policies centered on restoring economic health and confidence and focused on creating a market-oriented and socially responsible economy. She became the first Filipino to be bestowed with the prestigious Prize For Freedom Award in 1987. Aquino faced several coup attempts against her government and various natural calamities until the end of her term in 1992. She was succeeded as President by Fidel Ramos, and returned to civilian life while remaining public about her opinions on political issues. In recognition for her role in the world's most peaceful revolution to attain democracy, she was awarded the prestigious Ramon Magsaysay Award in 1998. In 2008, Aquino was diagnosed with colorectal cancer and died on August 1, 2009. Her monuments of peace and democracy were established in the capital Manila and her home province of Tarlac after her death. Her son Benigno Aquino III became President of the Philippines from June 30, 2010 to June 30, 2016. Throughout her life, Aquino was known to be a devout Roman Catholic, and was fluent in French, Japanese, Spanish, and English aside from her native Tagalog and Kapampangan. She is highly regarded by the international diplomatic community as the Mother of Asian and Philippine Democracy. Benigno Simeon "Ninoy" Aquino Jr. (November 27, 1932 – August 21, 1983) was a Filipino politician who served as a Senator of the Philippines (1967–1972) and governor of the province of Tarlac. He was the husband of former Philippine President Corazon Aquino and father of former Philippine President Benigno Aquino III. Aquino, together with Gerardo Roxas and Jovito Salonga, formed the leadership of the opposition towards then President Ferdinand Marcos. Shortly after the imposition of martial law, he was arrested in 1972 along with others associated with the Communists' armed insurgency and incarcerated for seven years. He founded his own party, Lakas ng Bayan, and ran in the 1978 Philippine parliamentary election, but all of the party's candidates, including Aquino, lost in the election. In 1980, Aquino was permitted by Marcos to travel to the United States for medical treatment following a heart attack. He was assassinated at the Manila International Airport in 1983 upon returning from his self-imposed exile. His death catapulted his widow, Corazon, into the political limelight, and prompted her to run for president as member of the UNIDO party in the 1986 snap elections. Among other public structures, Manila International Airport has since been renamed Ninoy Aquino International Airport in his honor, and the anniversary of his death is a national holiday. in lower left corner is The People Power Revolution of 1986. The People Power Revolution (also known as the EDSA Revolution and the Philippine Revolution of 1986 or simply EDSA 1986) was a series of popular demonstrations in the Philippines, mostly in the capital city of Manila from February 22–25, 1986. There was a sustained campaign of civil resistance against regime violence and alleged electoral fraud. The nonviolent revolution led to the departure of dictator Ferdinand Marcos, the end of his 21-year presidential rule, and the restoration of democracy in the Philippines. It is also referred to as the Yellow Revolution due to the presence of yellow ribbons during demonstrations following the assassination of Filipino senator Benigno "Ninoy" Aquino, Jr. in August 1983. It was widely seen as a victory of the people against two decades of presidential rule by President Marcos, and made news headlines as "the revolution that surprised the world". 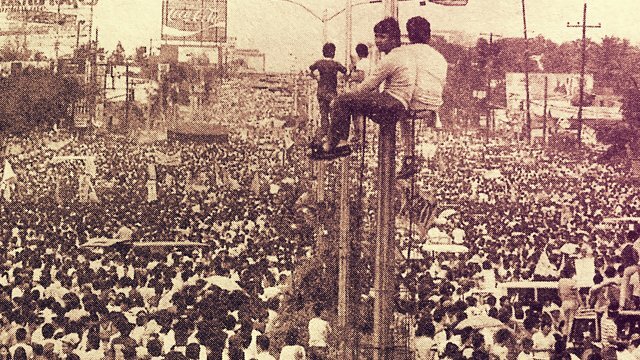 The majority of the demonstrations took place on a long stretch of Epifanio de los Santos Avenue, more commonly known by its acronym EDSA, in Metro Manila from February 22–25, 1986. They involved over two million Filipino civilians, as well as several political and military groups, and religious groups led by Cardinal Jaime Sin, the Archbishop of Manila, along with Catholic Bishops' Conference of the Philippines President Cardinal Ricardo Vidal, the Archbishop of Cebu. The protests, fueled by the resistance and opposition from years of governance by President Marcos and his cronies, culminated with the absolute rule and his family fleeing Malacañang Palace to exile in Hawaii. 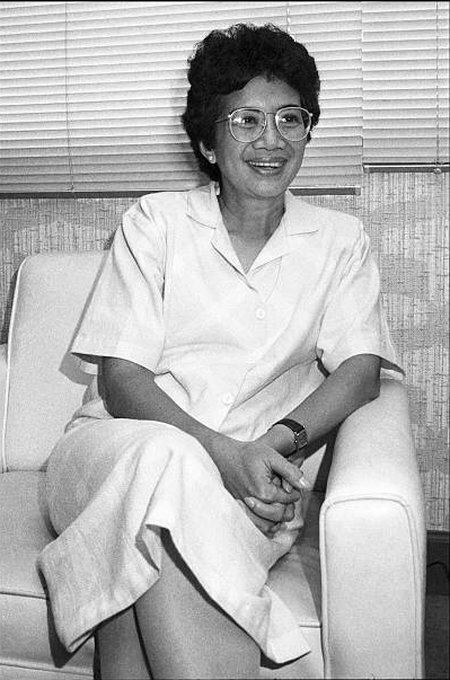 Ninoy Aquino's widow, Corazon Aquino, was immediately installed as the eleventh President as a result of the revolution. At the bottom, centered is the Benigno Aquino monument in Makati City. 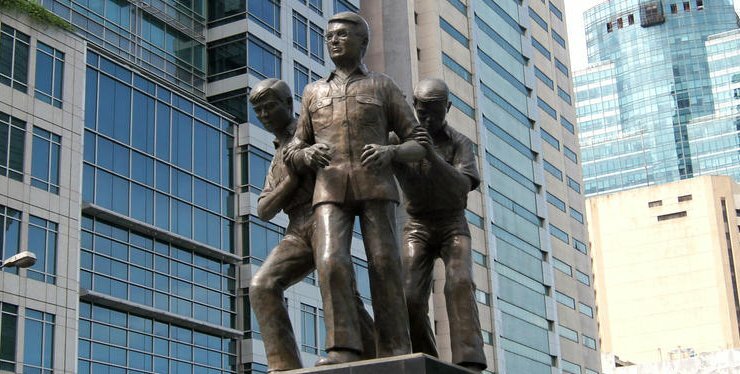 The Ninoy Aquino Monument is a bronze monument by sculptor Peter de Guzman which commemorates the slain of former senator and Filipino hero Benigno “Ninoy” S. Aquino Jr., the father of the current President of the Philippines, Benigno “Noynoy” Aquino III. As one of the leaders in the opposition against the dictatorship of Ferdinand Marcos, Ninoy protested the social injustices committed during the martial law for years and publicly attached Marcos’ regime. 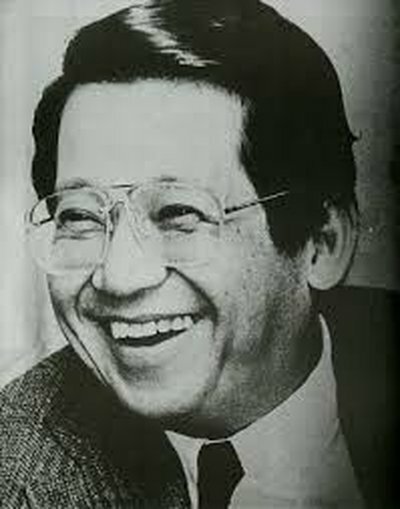 Ninoy Aquino was assassinated in 1983 at the Manila International Airport. His widow, Corazon “Cory” C. Aquino, became part of the movement to regain democracy. In 1986, Cory Aquino ran against Marcos in the snap presidential elections. Despite massive cheating in the polls in favor of Marcos, Cory was sworn in as the first female President of the Philippines through a peaceful People Power Revolution. In the foiled window, the image of the reverse is repeated - a blue-naped parrot (Tanygnathus Lucionensis) sits on a branch. 1) Subterranean Underground River in Puerto Princesa, Palawan. 2) Tanygnathus lucionensis (blue-naped parrot). 3) Southern Philippines cloth design. 4) Map of the Philippines with a marked province of Palawan. The Puerto Princesa Subterranean River National Park is a protected area of the Philippines. It was listed as a UNESCO World Heritage Site in 1999, and voted as a New 7 Wonders of Nature in 2012. It also became a Ramsar Wetland Site in 2012. 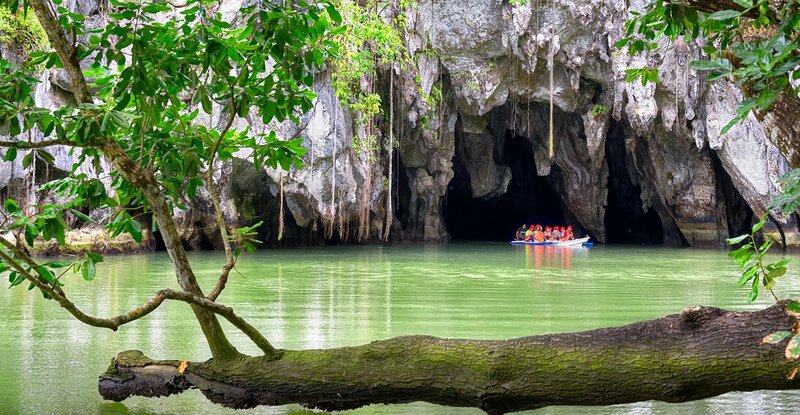 The Puerto Princesa Subterranean River National Park is a protected area of the Philippines located about 80 kilometers (50 mi.) north of the city center of Puerto Princesa, Palawan. The river is also called 'Puerto Princesa Underground River'. The national park is located in the Saint Paul Mountain Range on the western coast of the island. It is bordered by St. Paul Bay to the north and the Babuyan River to the east. The City Government of Puerto Princesa has managed the National Park since 1992. The entrance to the subterranean river is a short hike or boat ride from the town Sabang. In 2010, a group of environmentalists and geologists discovered that the underground river has a second floor, which means that there are small waterfalls inside the cave. They also found a cave dome measuring 300 m. (980 ft.) above the underground river, rock formations, large bats, a deep water hole in the river, more river channels, and another deep cave, as well as marine creatures and more. Deeper areas of the underground river are almost impossible to explore due to oxygen deprivation. The park has a limestone karst mountain landscape. St. Pauls Underground River Cave is more than 24 km. (15 mi.) long and contains an 8.2 km. (5.1 mi.) long underground section of the Cabayugan River. The river winds through the cave before flowing directly into the West Philippine Sea and is navigable by boat up to 4.3 km. (2.7 mi.) in from the sea. The cave includes major formations of stalactites and stalagmites, and several large chambers, including the 360-meter-long Italian's Chamber with approximate 2.5 million square meters volume. It is one of the largest cave rooms in the world. The lower portion of the river up to 6 km from the sea, is subject to tidal influences. Until the 2007 discovery of an underground river in Mexico's Yucatán Peninsula, the Puerto Princesa Subterranean River was reputed to be the world's longest underground river. Birds comprise the largest group of vertebrates found in the park. Of the 252 bird species known to occur in Palawan, a total of 165 species of birds were recorded in the park. This represents 67% of the total birds and all of the 15 endemic bird species of Palawan. Notable species seen in the park are the blue-naped parrot (Tanygnathus lucionensis), Tabon scrub fowl (Megapodius cumunigii), hill myna (Gracula religiosa), Palawan hornbill (Anthracoceros marchei), white breasted sea eagle (Haliaeetus leucogaster). 19 species of reptiles have been identified, eight of which are endemic. Common species in the area include large predators like the common reticulated python [Python reticulates], the monitor lizard (Varanus salvator) and the green crested lizard (Bronchocoela cristatella). Amphibian fauna include ten species. The Philippine woodland frog (Rana acanthi) is the most dominant and frequently encountered. One species, Barbourula busuangensis, endemic to Palawan was also observed in the area. Notable are the nine species of bats, two species of swiftlets and whip spider (Stygophrynus sp.) found in the cave, and the sea cow (Dugong dugon) and the hawksbill sea turtle (Chelonia mydas) that feed in the coastal area of the park. The blue-naped parrot sitting on tree branch. The blue-naped parrot (Tanygnathus lucionensis), also known as the blue-crowned green parrot, Luzon parrot, the Philippine green parrot, and locally known as pikoy, is a parrot found throughout the Philippines. In 1760 the French zoologist Mathurin Jacques Brisson included a description of the blue-naped parrot in his Ornithologie based on a specimen collected on the island of Luzon in the Philippines. He used the French name Le perroquet de l'Isle de Luçon and the Latin name Psittacus lucionensis. Although Brisson coined Latin names, these do not conform to the binomial system and are not recognised by the International Commission on Zoological Nomenclature. When in 1766 the Swedish naturalist Carl Linnaeus updated his Systema Naturae for the twelfth edition he added 240 species that had been previously described by Brisson. One of these was the blue-naped parrot. Linnaeus included a terse description, used the binomial name Psittacus lucionensis and cited Brisson's work. The specific name lucionensis is from Luzon in the Philippines. This species is now placed in the genus Tanygnathus which was introduced by the German naturalist Johann Wagler in 1832. T. l. hybridus: Polillo Islands. Blue on crown less extensive, tinged with violet. More green on wing coverts. This is a medium size parrot, around 31 cm (12 in) in length, primarily green except for a light blue rear crown and nape, pale blue lower back and rump, scalloped shoulders with orange-brown on black coverts, and blackish underwings with green underwing coverts. The species is widespread throughout the Philippines, including the Talaud Islands and islands off north and east Borneo (with introduced population in Borneo itself, e.g. Kota Kinabalu). It is found in secondary forest, at forest edges and in plantations at elevations of up to 1000 m. Flock size is usually under a dozen. 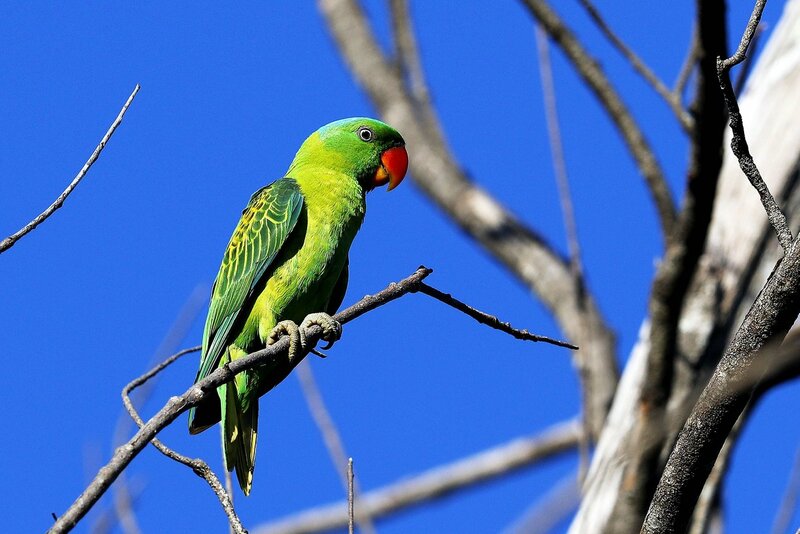 The blue-naped parrot feeds on mangoes, berries, seeds, nuts and grains. It nests in tree holes. On right side is Southern Philippines cloth design.